Successfully Added Tronsmart CC2F USB Rapid Car Charger - Quick Charge 2.0, VoltIQ, 36W to your Shopping Cart. 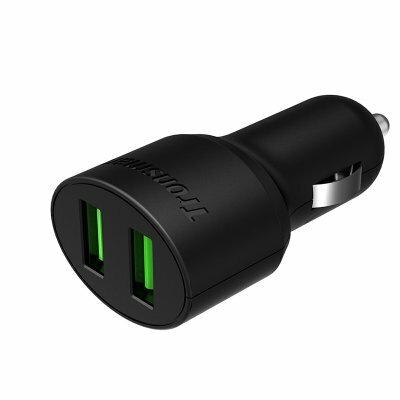 Efficiently charge your smartphone on the go with the rapid USB car charger from Tronsmart. With the Tronsmart USB Rapid Car Charger, you can conveniently charge up your phone as your drive, and do that quickly and efficiently. Tronsmart’s USB rapid car charger features Quick Charge 2.0 technology. Thanks to it, you can reduce your gadget charging time for up to 75%. So, if your smartphone supports Quick Charge 2.0, your life with the Tronsmart car charger is sure to get more efficient. Lots of mobile devices already support the technology (including Samsung Galaxy S6/S6 Edge, HTC M9, Nexus 6 and others), while more are sure to join the trend in the nearest future. In addition to Quick Charge 2.0, the Tronsmart car charger features VoltIQ, allowing it to automatically recognize various devices. With the two-in-one USB charger, you will be able to power up two gadgets simultaneously, using the two DC 5V2.4A, 9V2A, 12V/1.5A (max) outputs. Efficient, easy-to-use and compact, the Tronsmart USB Rapid Car Charger is a simple and practical vehicle accessory. The Tronsmart CC2F USB Rapid Car Chargercomes with 12 months warranty. Brought to you by the leader in electronic devices as well as wholesale USB car chargers, Chinavasion..